Lots of great work tonight. First I started out with making a little shim out of some 032 to support the back of the headset jack. See, because the hole is half way on the doubler, I needed to support the back of the jack with a shim. Here the above made shim is glued onto the F-705 bulkhead with some GOOP. I am loving that stuff more and more every day. Also, I should note that I think the doubler is actually 040 and not 032. Close enough for me. I ran the headset and mic wires on floor. And up the back of the F-705 bulkhead. Next I soldered them to the jacks, and mounted the jacks in the bulkhead. 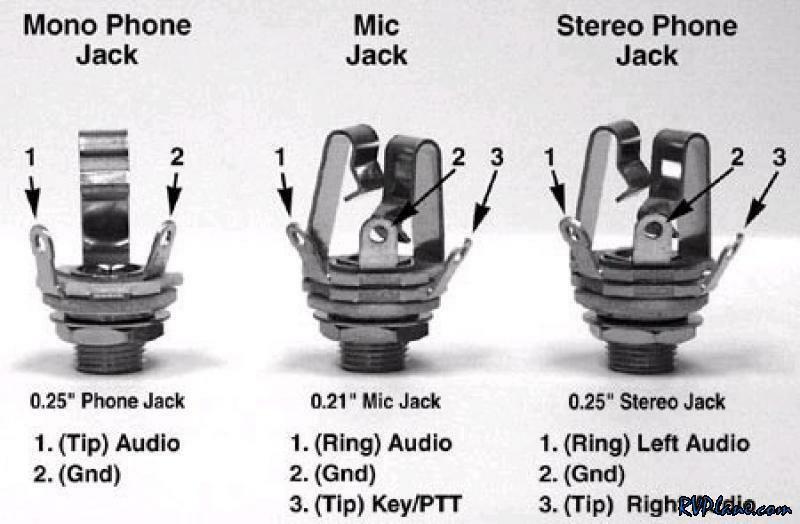 Here is a pic I found on how to wire the headsets from Richard Horans (www.rvproject.co.uk). builders log. Looks OK. I would of liked them a little more centered, but this location is heavily hidden. Headset is plugged in, only one thing left to do. So I fired up the avionics and tested it all out. Intercom worked great. COM1 received and transmitted. COM2 received and transmitted. I heard some clicks on NAV1 when I hit the ID button (I have no way to produce a VOR frequency to test, and I don't have a VOR antenna, so I will have to wait until I get to the airport). Cool. Headset jacks are DONE. For whatever reason next I put a new hole in the side of the fuselage for the pitot tube (green hose). And then I ran the pitot through the F-704 bulkhead and roughly up to the panel area. With the zip-tie mounts glued, I installed some zip ties for the magnetometer wire. I routed it through through the conduit I installed way back int he day and through the same hole in the F-704 bulkhead the pitot tube went through. The holes in the bulkhead are getting very limited..... I might have to put another one in before I am done. With the magnetometer wire run, I put on new ends and checked out the EFIS. Seems to be perfect. One thing that has been bothering me is I have been running the battery low. So I did a little R&D and found a trickle charger that works well with the Odyssey batteries. Here is a quick cable I made up connecting it to the battery bus. The charger I chose was the Black and Decker BM2B charger. It was about $18 at Home Depot. It seems to work well. I needed to notch the top of the flap cover so the headset wires could pass through. Looks good. I am going to make a clover that goes over the back of the jacks to add some protection.